We concluded the academic year last Friday with commencement exercises for the Cumberland class of 2016. Graduates and their families enjoyed a beautiful reception on Brewer Plaza in gorgeous spring weather followed by a splendid commencement program in the Wright Center. Although I have sat through many graduation ceremonies (over fifty at Samford alone), I still find them moving. This commencement ceremony was particularly special, because the first Jere F. White, Jr. Fellow graduated this year. The late Jere F. White, Jr. ‘80 and his family created the Jere F. White Fellowship program prior to Jere’s all too early passing in 2011. This remarkable fellowship, which rivals any law school scholarship in the country, provides full tuition as well as a stipend and funding to study in Cumberland’s summer program in Cambridge, England. Perhaps most importantly, it provides that support to a student who not only has strong academic credentials but who has a history of leadership and a demonstrated commitment to service. A scholarship committee screens applications for the fellowship, interviews finalists, and selects each year’s fellow. As dean, I am honored to serve on that committee along with members of Jere’s law firm (Lightfoot, Franklin & White), Jere’s son Bennett, Jere’s colleagues from other law firms, and even some of his courtroom adversaries—all some of the best lawyers in the country. The fellowship is gaining notoriety and draws many great students to Cumberland, including finalists who do not receive the scholarship. The first Jere F. White, Jr. fellowship was awarded to Caroline Collins Muse who matriculated at Cumberland in August of 2013, and she graduated on Friday after an outstanding law school career. This year’s commencement address also could not have been more fitting. Rather than bringing in an outside speaker, we again had the graduating class select the speaker from the Cumberland faculty. The class selected Adjunct Professor Terry McCarthy. Terry is a partner in the law firm of Lightfoot, Franklin & White but teaches at Cumberland part time. He regularly teaches Advanced Evidence but he taught the first-year, required Evidence course to the graduating class two years ago when one of our full-time professors was away. Selecting Prof. McCarthy by vote, the graduating class could not have known how appropriate it was to select a member of Lightfoot, Franklin & White, Jere White’s firm, to speak at the first commencement at which a Jere F. White, Jr. Fellow graduated. Exhibiting all the skills of a great trial lawyer, Prof. McCarthy captivated the class and the audience with three stories: the story of a young girl whose work and inspiration helped raise millions of dollars for cancer research, wonderful stories of the graduating class, and the story of Jere White. He described Jere’s remarkable career and his commitment to serving others even when he was sick. He noted how Jere loved Cumberland and generously gave back to the school. He described how Jere fought relentlessly in court but remained fast friends with his adversaries. 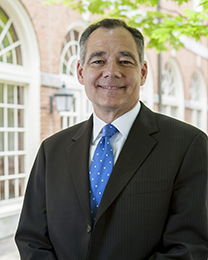 He noted that one of Jere’s most formidable adversaries, David Marsh ‘81 , who was in the audience because his son was also a member of the graduating class, has done as much as anyone to make the Jere F. White, Jr. Fellowship program a success. In sum, the evening provided an inspirational send off for the Class of 2016, demonstrating concretely how successful Cumberland graduates continue to support current Cumberland students and illustrating the high level of professionalism and service to which Cumberland lawyers aspire.